Vintage string of tassels used as camel trappings in India. Canvas and leather sparring gloves. Little beat-up as suits their purpose. 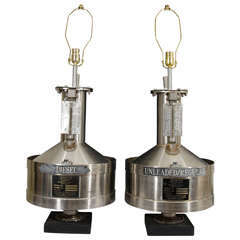 Vintage cast alloy table lamp with a strong maritime/Brutalist feel. Bakelite bulb holder. Bulb not included. 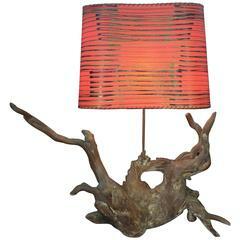 Excellent vintage driftwood base lamp with funky 1970s style lampshade. Very cool statement piece of lighting. Interesting studio pottery lamp with shade. 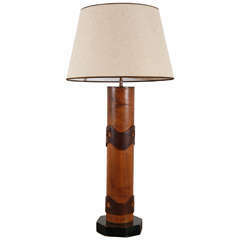 Vintage driftwood table lamp with original period burlap drum shade. USA, circa 1960. Dimensions: 17 inches W × 9 inches D × 39.5 inches H.